1999-2012 – Director of the Shaykhantahur academic lyceum under the University of World Economy and Diplomacy, Head of the Department of Mathematical Modeling and Computer Science until 2003, 2011-2012 Vice-Rector (at the same time). 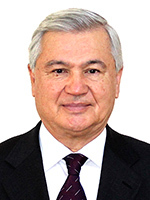 2012-2015 – Head of the Department of Decision Theory of The Academy of Public Administration under the President of the Republic of Uzbekistan. 2015-2016 – Associate Professor of the Department of Information and Communication Technologies in Management of the Academy of Public Administration under the President of the Republic of Uzbekistan. Supervises the issues of academic affairs. Born in March 1947 in Tashkent. Uzbek. In 1965 graduated high school with a gold medal. In 1970 graduated Tashkent State University. 1970-1983 - teacher, senior researcher, head of the department, chief scientific secretary in research institutes and universities of Tashkent, social and political activist in youth and party organizations. 1983-1986 – head of the department of science and educational institutions of the Tashkent regional party committee. 1986-1988 - First Deputy Chairman of the «Knowledge» organization of Uzbekistan. 1988-1991 - scientific consultant, head of the department of Central Asia and Kazakhstan, Department of Interethnic and Interstate Relations of the Central Committee of the CPSU, Moscow. 1988-1991 - Professor of the Department of Political Science, Moscow State University, Professor of the Department of International Relations in the Academy of Social Sciences (Moscow) (part-time). 1991-1992 - Assistant of the President of Uzbekistan for particularly important assignments. 1992-1993 - State Advisor of the President of Uzbekistan on science, culture, education and social development. 1993-1998 - State Advisor of the President of Uzbekistan on political issues. 1992-1998 - Rector of the University of World Economy and Diplomacy (part-time). 1993-1994 - Minister of Foreign Affairs of the Republic of Uzbekistan. 1994-1996 - Deputy Prime Minister of the Republic of Uzbekistan. 1993-1997 - Chairman of the National Commission of Uzbekistan for UNESCO Relations. 1999-2014 - scientific and pedagogical activity: he gave special courses, lectures and reports at Moscow State University, Russian Academy of National Economy and Public Administration under the President of the Russian Federation, Diplomatic Academy of the Ministry of Foreign Affairs of the Russian Federation, Institute of Oriental Studies of the Russian Academy of Sciences, Academy of the Ministry of Internal Affairs of the Russian Federation, Harvard, Boston, Princeton Universities of the USA, Harvard Institute of International Development, Harvard Business School, Massachusetts Institute of Technology, United States, Academy of Development United States Education, World Bank Institute for Economic Development, University of Westminster and Oxford UK, London School of Economics, Schools e Eastern and African studies of the University of London, universities of France, Japan, China, India, Pakistan, Iran, Turkey, Sri Lanka, Cuba, Mongolia. Internship at the Economic Development Institute of the World Bank (Washington, 1995). Honorary Director of department of the UNESCO at the University of Zimbabwe (since 1995). 2013-2018 - Professor of Korean, Hankuk, Khanyang, Inha, Aju universities in South Korea. 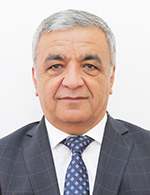 2018 – Vice-Rector for International Relations, University of World Economy and Diplomacy under the Ministry of Foreign Affairs of the Republic of Uzbekistan. Academy of Public Administration under the President of the Republic of Uzbekistan. Specialty: History, History of the Motherland, Finances. Member of the Liberal Democratic Party of Uzbekistan. Implements and ensures the rational use of funding of the educational establishment.